My French neighbours had very kindly given us a bag of their home grown cauliflower this week. So far I’ve made cauliflower cheese (a bit boring) and Brown Rice with Vegetables which is an old Delia Smith recipe that I’ve adapted from our vegetarian days. It’s brown rice (surprisingly enough) with onions, carrots and bacon bits (that’s my unveggie ingredient) with stir fried cauliflower and cabbage, topped with a cheese sauce – yummy. I decided to try making the remainder into a soup and looked up a recipe on the web. 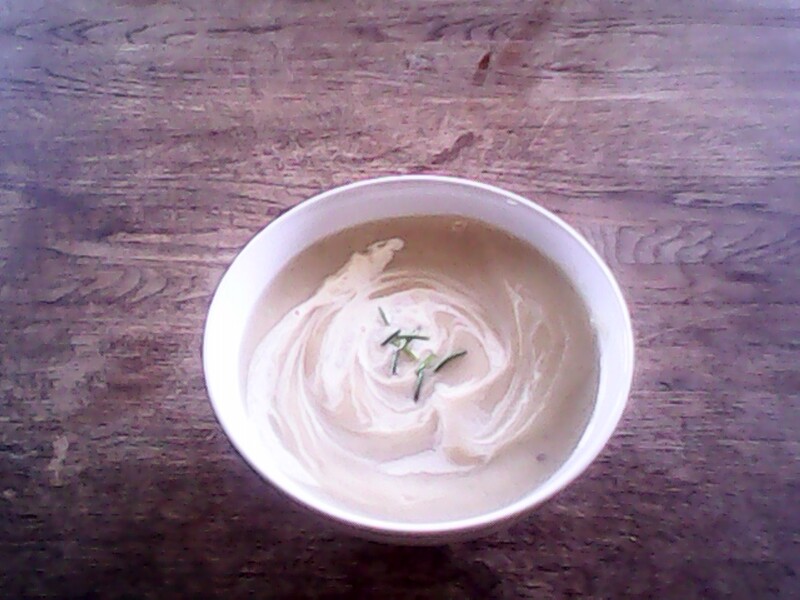 I wasn’t sure whether the flavour of cauliflower might come through a bit strong in the soup, but rather than let it rot, I thought I’d give it a try. To my surprise it was really tasty and the proof of the pudding (so to speak) was that my two youngest (7 and 5) loved it and asked for seconds. One big pot of cauliflower soup polished off in less than 30 minutes. Here’s the recipe if you fancy trying it – it’s a doddle! 1 tsp Cumin (I didn’t have any cumin so I put in ½ teaspoon of garam masalla and ½ teaspoon of paprika). 1 lt of chicken or vegetable stock (I used chicken stock cubes). Heat the oil in a large pan and gently fry the onions and garlic for a few minutes. Add the cauliflower and spices and gently fry for another couple of minutes. Add the stock, bring to the boil, then turn down and simmer for about 15 minutes or until the cauliflower is soft. Remove from the heat and liquidize with a stick mixer or liquidizer (I find the stick mixer is much easier especially when I’m usually cooking large quantities of soup. It tends to leave a few lumps of vegetables in it but my kids think it’s an added bonus to have find a lump of vegetable in their soup). Serve with a swirl of cream (according to taste) and sprinkle a few chopped chives on top if you have any. This entry was posted in Food, Uncategorized and tagged Cauliflower Soup, Food. Bookmark the permalink.